Vivint Smart Home Arena, one of the oldest NBA venues, now has one of the more advanced in-arena digital display systems, thanks to a recent deployment of 600-plus Samsung “system on a chip” screens, which don’t require a separate digital media player to operate. 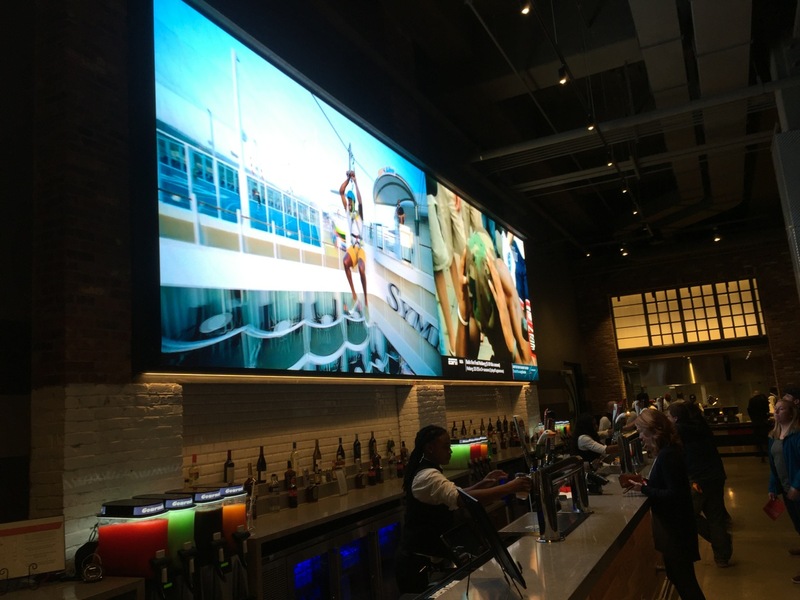 Part of a recent remodel of the home of the Utah Jazz, the new display screens are mounted throughout the concourses, in club areas and suites, as well as in concession stands. 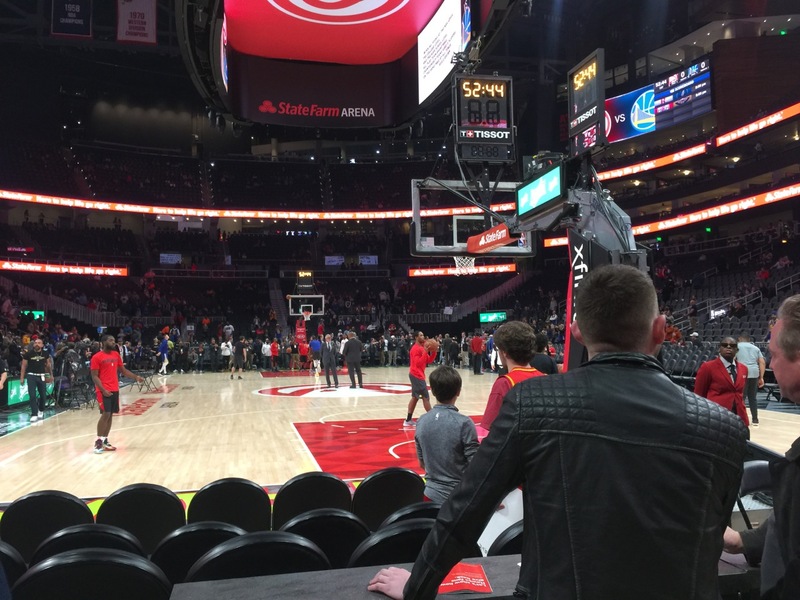 Run on management software from RevelTV, the screens currently show a mix of live game action and an ever-changing program of advertisements, both from outside sponsors as well as inside marketing programs for Jazz tickets and tickets to other events like concerts. 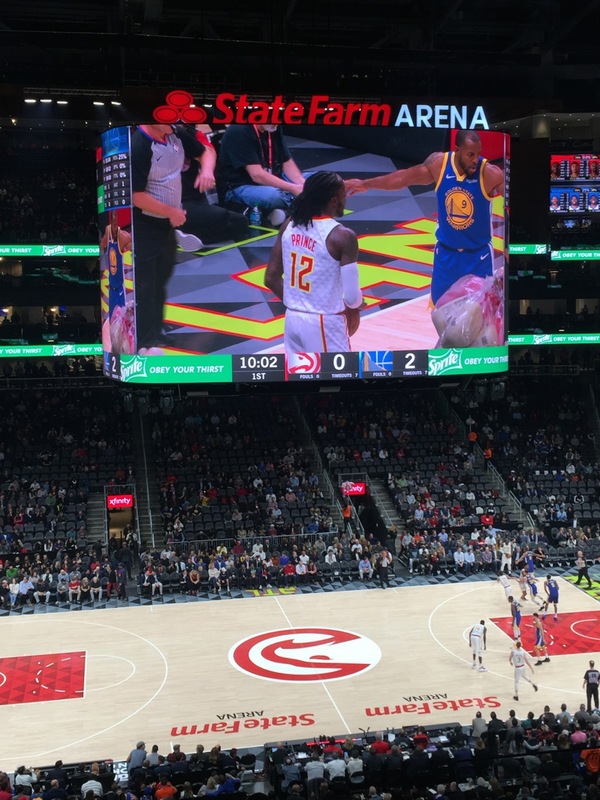 The displays are also used for concessions menu boards, often mounted next to other displays showing live action so that fans waiting in concession lines don’t miss a single Rudy Gobert dunk or a Joe Ingles 3-pointer. 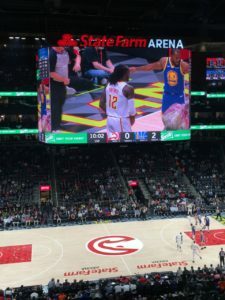 Those fans also now see an increasingly growing number of messages, all pushed from a central location on a system that seems light years ahead of the stadium’s previous display technology. A vertical display with advertising atop live game action. 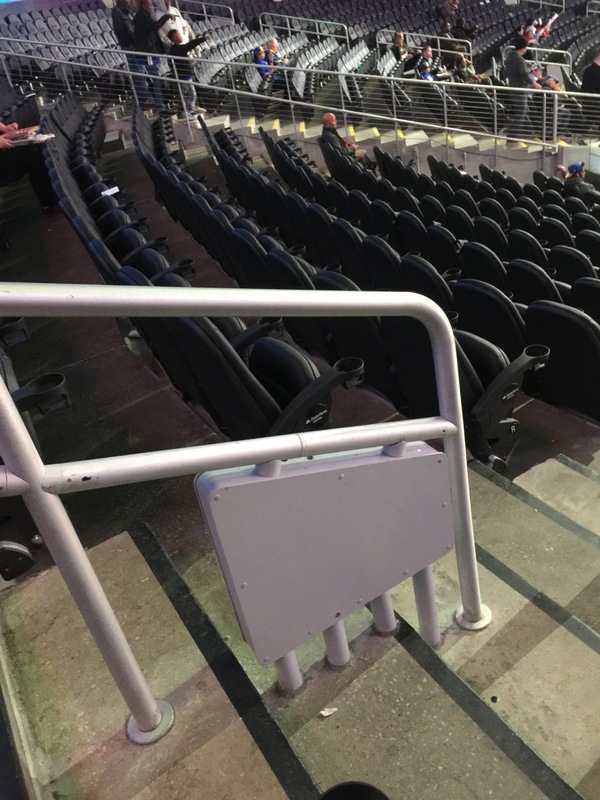 In a recent tour of the stadium before a home game against the Denver Nuggets, BJ Vander Linden, CIO for Larry H. Miller Sports & Entertainment (the Jazz owners), said many things inside Vivint Smart Home Arena were changed during a recent $125 million makeover. 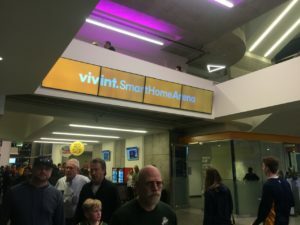 In addition to some physical and structural changes — mainly opening up walls and turning former office space into open-air club spaces — Vivint Smart Home Arena also got a big digital display upgrade. 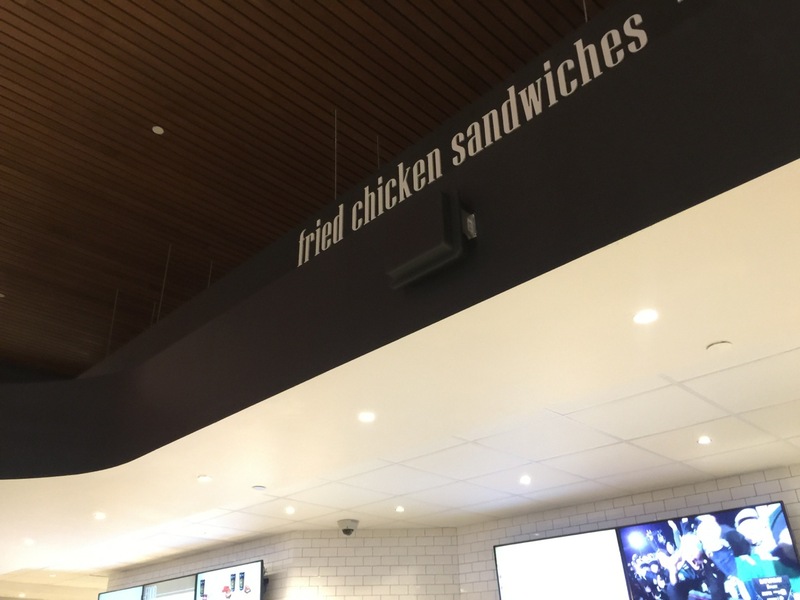 “We wanted to make it more simple to put things on the walls,” said Vander Linden of one of the overarching signage strategies. 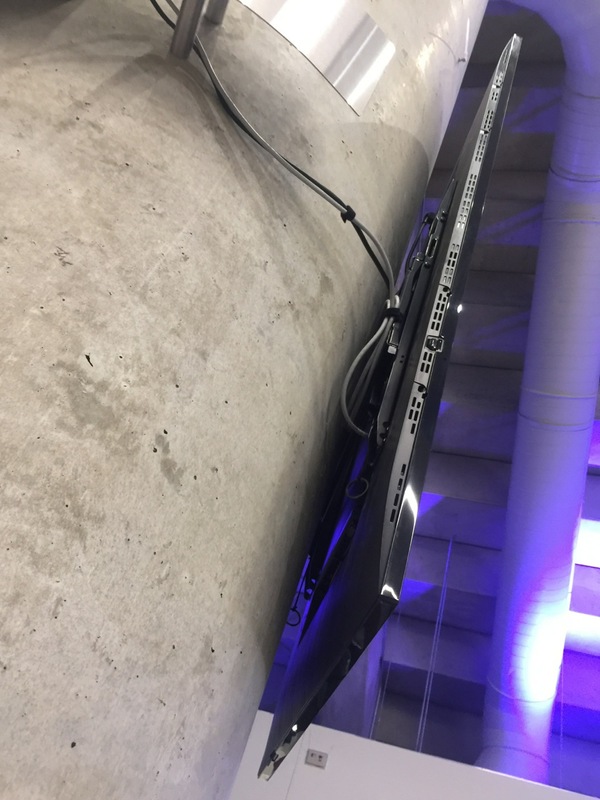 The Jazz also wanted to move past the arena’s former display technology, which used digital media players (DMPs) on the backs of screens. According to Vander Linden, that system had fixed programs for each display, which couldn’t be easily changed. “You would just sell them one time for the entire season,” Vander Linden said. After dealing with Samsung’s Prismview division for its new center-hung video display and its in-bowl ribbon boards, the Jazz decided to buy in to Samsung’s so-called “system on a chip” (or SOC) Smart Signage display technology, where the DMPs are essentially embedded into the display itself. Ed Stock, global account manager for sports and entertainment at Samsung, said the SOC displays not only cut deployment costs significantly by making the DMP costs go away, they are also easier to deploy and maintain since they only require a network connection and power, which can sometimes be deployed in a PoE (power over Ethernet) connection. Also part of the display partnership was RevelTV (also known as Revel Media Group of Kaysville, Utah), which provides the content management system that runs the display programs, as well as templates and designs for screens and displays of all types and sizes, including concession menu boards and multi-screen display panels. A look at the minimal infrastructure needed to mount the Samsung displays. RevelTV president and CEO Brian Fitzpatrick said that RevelTV also has a game-day operator on hand to help the Jazz run their display show, as well as design teams who can help ensure that content looks like it should in the 12 different resolutions found in the mix of displays at Vivint Smart Home Arena. 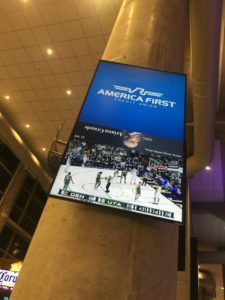 Vander Linden said the Utah Jazz can now sell a wide range of display-based options, including messages timed to live events. “It’s like selling TV ads,” Vander Linden said. Currently in its inventory, the Jazz sell all-screen “takeovers” for game action like 3-point shots or a Rudy Gobert block or dunk. If the arena’s main competition really is the fan’s living room couch, Vander Linden said having a display system that can keep creating visual energy only helps to make the live event an even more entertaining place to be. For now, Vander Linden likes that the new display systems are easier to maintain, and easier to expand to places where there previously were no displays. In the future, he foresees even more flexibility and opportunity with the new display system, perhaps adding elements like facial recognition (where the displays could sense how long people look at the screen) and machine learning to figure out better places to put displays or how long to run different pieces of content. But right now, with live game action right next to sponsor messages as well as advertisements for upcoming events (like concerts) at Vivint Smart Home Arena, the concourse display system is already helping Vander Linden and the Jazz keep its fans entertained and informed, while improving its own bottom line — and keeping that couch empty. 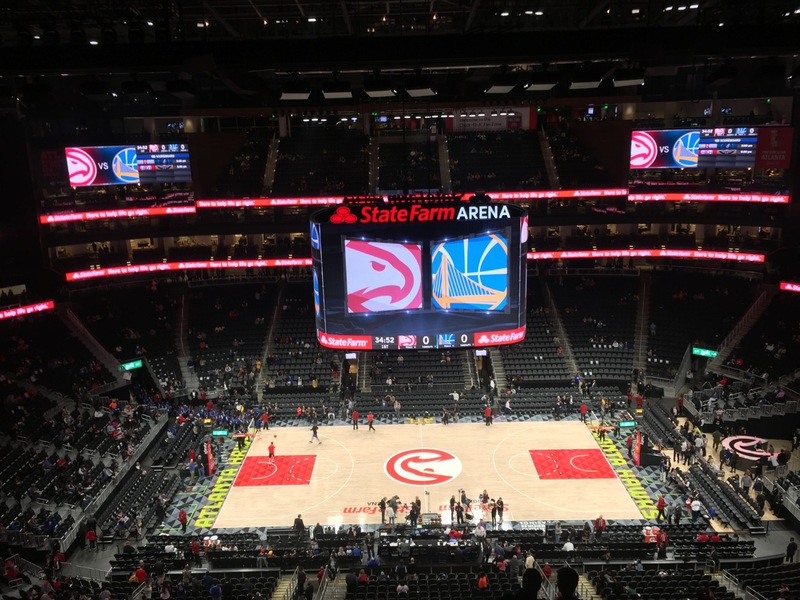 Will cellular carrier aggregation matter in stadium networks? Over the past few days, both Sprint and Verizon Wireless have made announcements about a technique called “carrier aggregation” (CA for short) for LTE cell networks that basically bonds together different frequency channels to bring more bandwidth to a mobile device. Though the premise sounds great, what we here at MSR HQ haven’t been able to ascertain yet is whether or not this technique will help solve the biggest problem in stadium network situations, namely providing enough capacity for users on the networks installed there. Sprint has made the most noise this week, with claims of CA demonstrations at Soldier Field in Chicago and Kansas City’s Kauffman Stadium that (they said) showed Sprint devices bonding three different frequency channels to hit download speeds of 230 Mbps, a score way off the charts for any existing stadium networks. (The fastest Wi-Fi and cellular speeds we’ve seen in our short history of stadium tests, by comparison, are in the 60 Mpbs range.) Verizon made a similar announcement about CA being put in across its network, without specifying if the service would be available in stadiums. Other carriers, including AT&T and T-Mobile, are also exploring use of the CA technique. At the very least, some lucky users with newer devices may see leaps in performance thanks to CA deployments, a good thing on any level. But our bigger question — which hasn’t been answered in the press releases and hasn’t (yet) been answered in email questions to Sprint or Verizon — is whether or not CA will help with overall network capacity, which to us seems to be a more pressing problem at most stadiums as opposed to simple download speeds. I mean, demos are great and it’s cool to see what the upper limits are for one device; but it’d be more impressive if Sprint could guarantee that 230 Mbps mark to every device in the park, should everyone there have a Sprint phone with the capability to perform the CA trick (not all devices in the market today can do so). 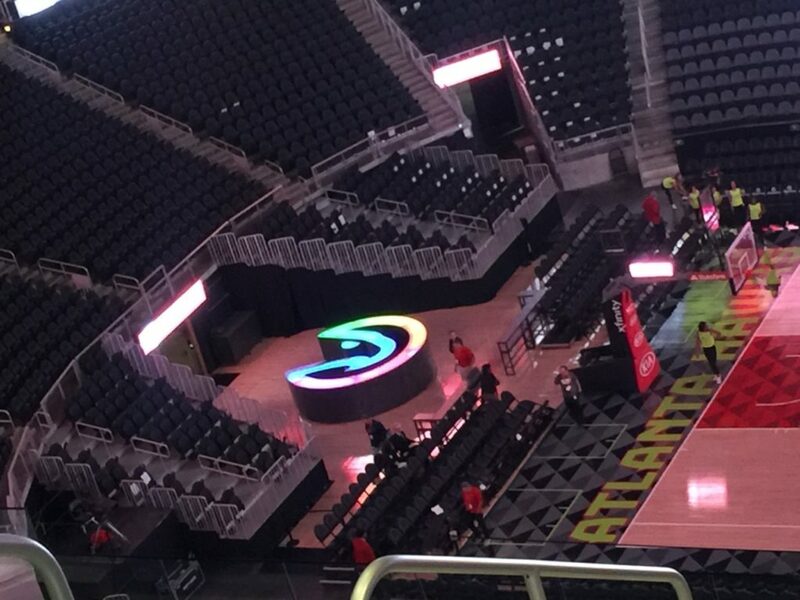 What’s also not completely revealed in the press releases is what kind of gear is necessary on the back end of the network to make CA work, and whether or not it makes economic sense to have that gear placed inside stadiums to enable the technique for as many fans as possible. While we understand the basic premise probably better than most (since in a former life yours truly spent several years following and analyzing the Clearwire spectrum holdings at 2.5 GHz) it’s not clear if CA solves any congestion problems, especially for carriers other than Sprint, who only have a limited amount of licensed spectrum in each market they serve. As we understand CA, by bonding channels you can make one device faster since it has more aggregate bandwidth to work with. But it’s not clear that using CA in a stadium environment would make the overall situation any faster than say, three phones using single channels by themselves. Also, since you can’t create new bandwidth, if one phone starts tapping three different channels doesn’t that actually leave less room for other devices that may want to also use those channels? Perhaps with CA the connections would be faster and wouldn’t last as long, thereby freeing up spectrum for other devices; again, there’s not a lot of information yet on the capacity side of the equation, especially in crowded stadiums or at big events where bandwidth needs escalate. If there are any cellular wizards in the audience with more knowledge of the situation, feel free to chime in. Essentially, sites with bonded channels will drive higher capacities. 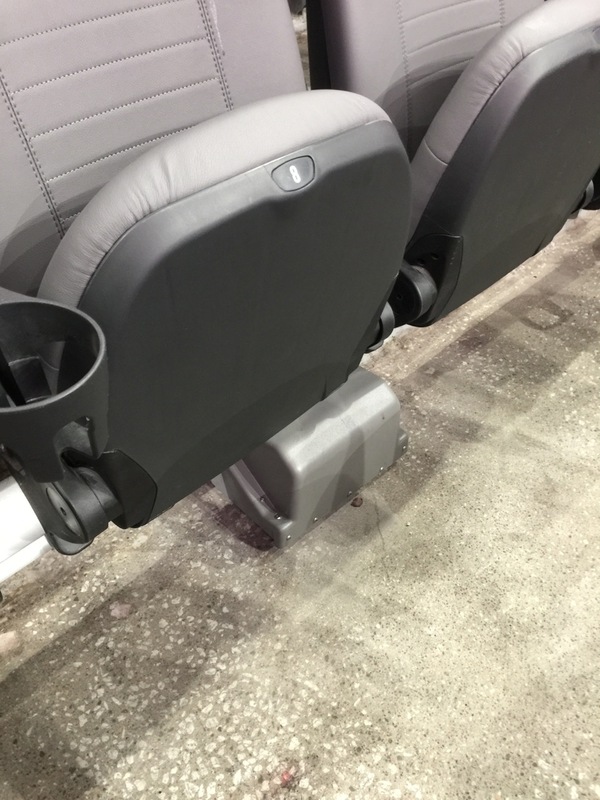 This will be especially timely and helpful in crowded spaces like Soldier Field where there are surges in capacity demand during live sporting events. Sprint customers with CA enabled phones will enjoy 2X (in the case of 2CA) or 3X (in the case of 3CA) their download speeds, which means that they will get a better data experience with a bigger pipe. But wait – CA will lift all boats and it will also benefit those Sprint customers who have not upgraded to CA enabled phones yet. While they may not enjoy the higher peak speeds enabled by CA phones, their phones will have access to more network resources which means they will also have a better data experience, with no stalling or without that dreaded “windmill effect” in a crowded stadium. I kind of understand what Saw is talking about here, but I am still having a problem with the math that says all boats will be lifted through the use of CA. Plus, experience and interviews have taught us that across the country, Sprint is behind Verizon and AT&T when it comes to DAS deployments inside stadiums; and, it’s not clear (and hasn’t been answered) whether or not CA can work over a neutral-host DAS deployment where carriers share antennas and other infrastructure. From an industry-wide standpoint, CA seems like a great thing for all cell phone users since as it progresses devices should be able to utilize whatever bandwidth is around to make performance better. It’s also good to see more technology advancements made on the network side of things, since infrastructure needs all the help it can get to keep up with devices. 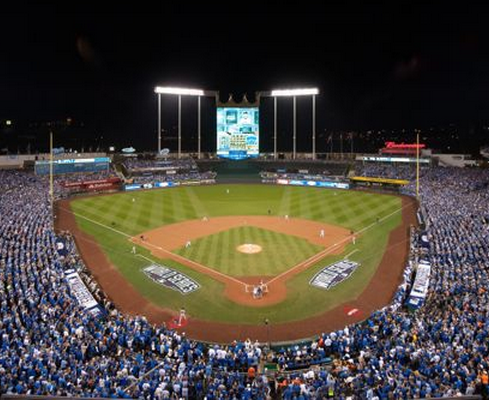 But right now, we’re not sure if CA is the answer to any of the capacity problems stadium network operators face. Anyone with views that can expand the explanation, feel free to hit the comments section below or send me an email to kaps at mobilesportsreport.com. 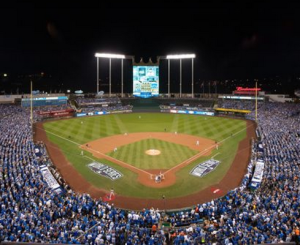 Virtual Reality and sports stadiums: What will fans see? Please let us know what you think of the podcast in the comments below! Google made a lot of noise a few years back with its push for Google Glass project, a pair of glasses that are connected to the Internet and now it is adding a second front in the wearable war with a push that it calls Android Wear. The company has launched the Android Wear project in an effort to greatly expand the market for wearable hardware and related technology, with but not limited to helping a new generation watches running the company’s Android operating system. The core of the effort will be a Software Developers Kit (SDK) that the company will be delivering to interested developers later this year. While connected watches seem to be the first area that this effort will have an impact Google sees the effort expanding into other areas including bringing additional technology to more established platforms such as tablets. However watches seem to be at the forefront of this space and potential developers that include everybody from Nike to Apple have indicated some level of interest in developing a watch. In addition there are already several connected watches on the market such as the Samsung Galaxy Gear and Pebble’s Steel Watch. Google has a number that have now announced their intention. With such a huge position in the smartphone operating system already Google has a huge advantage and it looks to be building on it quite quickly. Several partners have already announced intentions to build watches and in some cases have shown examples of their development efforts. 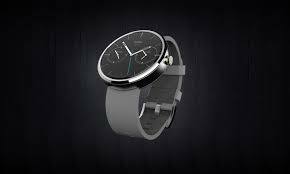 Motorola, unsurprisingly, has one in development called the Moto 360 Android that it said will be available this summer while LG Electronics said it would introduce its first Android watch, the G Watch, sometime this quarter. The watches will be equipped with a variety of sensors and the ability to connect to an Android phone. 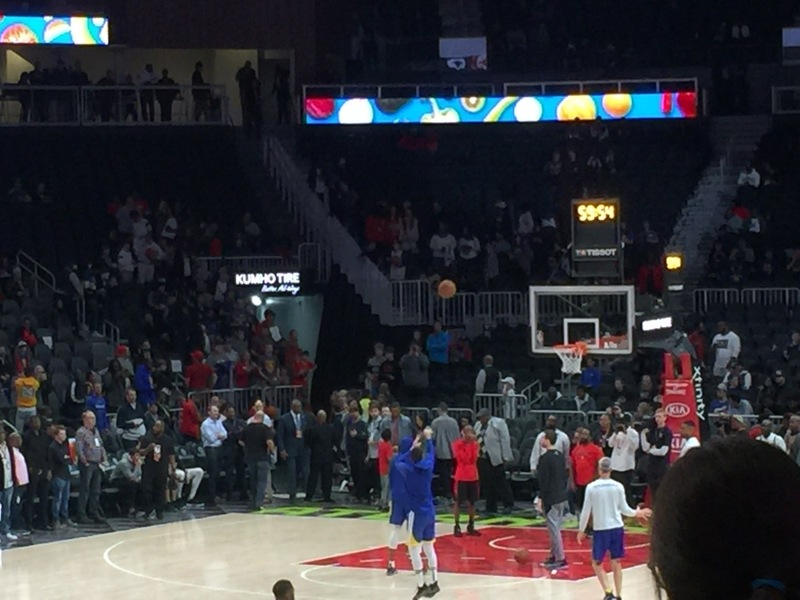 So it can sub for the fitness trackers that are popular with the athletically inclined. It will allow notifications and text messages to be forwarded from a user’s phone and enable voice replies. I imagine it would be a great tool to use to cheat on exams, but that might just be me. 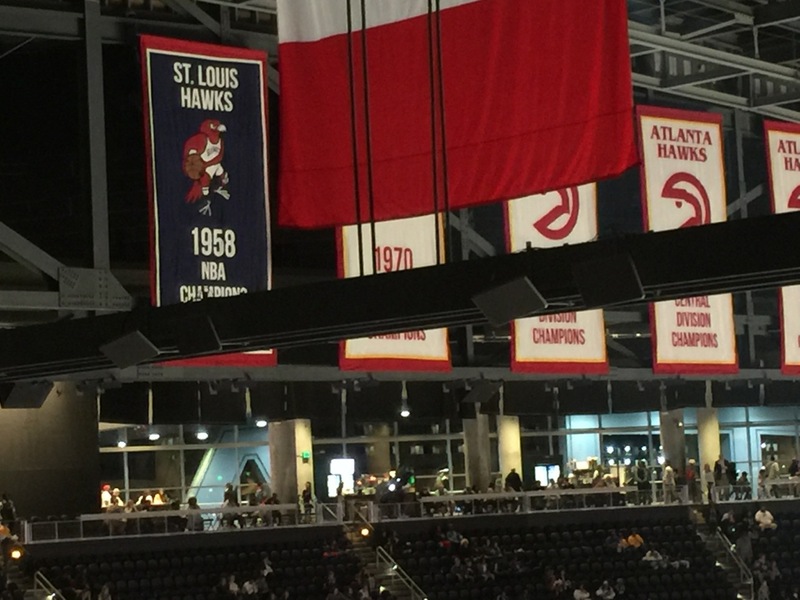 However being in a meeting and getting, say, March Madness game updates, could be a boon for those times when it is frowned upon to look at your smartphone. However the flip side of this is that many, at least those of us old enough, might just see this as a glorified pager with a bit more functionality.